This post is the sixth in a series in response to the question of what I think would make a life happy and fulfilling for my autistic daughter, Lily. I have often envied people who have a strong connection to one of the organized religions; the emotional support gained by being part of a community of like-minded, caring people as well as the guidelines for directing one’s life path, the moral guidance, the comfort of a GOD to pray to, the comfort of being in the right. In this instance though I am sad for my friends whose autistic children are not accepted in their church or synagogue because of behavior issues or embarrassment. They cannot share that important aspect of their lives with their child. The security they gained from being part of a larger community disappears. They might even lose their cherished faith in a god who could make their child suffer in this way. Spirituality is an important part of our lives as humans whatever form it takes. I am most comfortable communing with nature instead of inside a building with everyone dressed in their best clothes, on their best behavior. I am lucky that I can share this with my daughter and that she seems to really “get it” that we are all the same and at one with nature. She even partakes in sampling many of nature’s gifts in their most natural state such as leaves, flowers, rose hips, seaweed, and pine needles. She drinks the elixir of the gods, seawater, whenever she finds the opportunity. 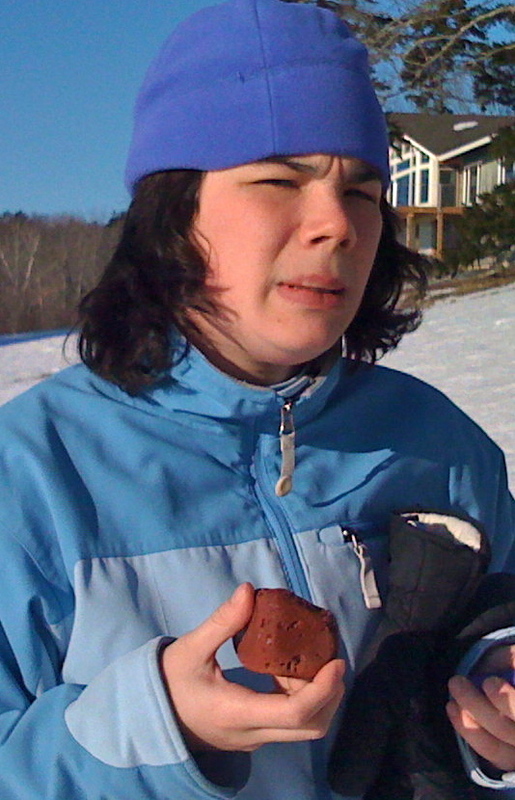 She carries rocks as her totems, often preferring the textures to her stuffed animal friends; they, too, can be licked! When I first began my middle-aged search for what had gone missing in my life, I remembered how as a youth I had attended church with my friends of all religions and denominations. I sang in the choir, attended Sunday school and summer bible camps. At college I took comparative religion courses and looked at the fads of the times, like Transcendental Meditation and yoga, without finding any one way that suited my inner life. I finally concluded that my rumored family history of Native American blood lines must be influencing my spiritual life, as I feel that all things, including the rocks and the water and the earth, are related; as they are in a physical sense, so too in a spiritual sense. Lily understands this as well; it is not something she needs to be taught or that needs to be explained. Perhaps the whole notion would seem primitive, and therefore beneath them, to those who base their lives on reading a book that other people wrote many, many years ago. The indigenous people of the earth have a connection with how things really are that layers of writings by the powers-that-be-in-the-land will never get even close to. This entry was posted in Autism, Spiritual Life, Uncategorized and tagged adults with autism, autism, autistic daughter, spiritual life. Bookmark the permalink. I get it too ! There is nothing I enjoy more than sharing Lily’s form of spirituality with all of you ! 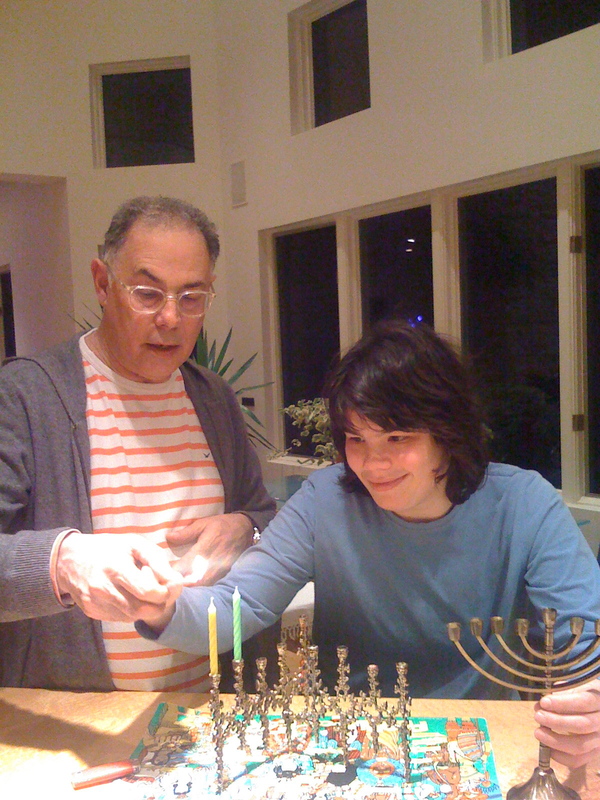 I love the photo of Lily and Sam lighting the candles. And, how joyous that the wordless sense of one-ness with nature is something that Lily feels too, and that you and she can share. I used to think I envied people who had a strong religious faith and connection to community … the Rick Santorums of the world make me content to be where I am.